Fuss-free, intuitive and sonically impressive, Master Mix wholly deserves resurrection, still holding its own in 2015. Flexible dynamics section. Good presets. Powerful Nodes feature. Soft clipper performs well. Nice price! Layout is a bit fiddly. No dedicated high-/low-pass filters. The new owners of Tracktion (headed up by its original designer, Julian Storer) have successfully rejuvenated its affordable, flexible DAW and are now branching out into plugin design and sales via an online store. 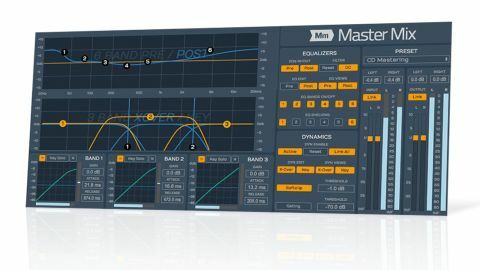 Master Mix (AU/VST/VST3) is one of their first two Tracktion-branded plugins (the other being Micro Synth Pack) and, as the name implies, it's a mix bus and mastering processor. It's based on the Final Mix plugin that shipped with Tracktion when it was owned by Mackie. However, as the new owners don't own the rights to that particular module, they have - with Mackie's consent - rewritten it from scratch. "The separate Pre and Post sections make it easy to drive the dynamics with targeted frequency lifts"
Master Mix includes two six-band EQs (Pre and Post); a three-band multiband dynamics processor with independent key settings; output Softclip with threshold setting; and an output gate. The interface is compact and well laid out, and includes three types of editor displays. The one at the top handles the EQ curves, the middle one handles the dynamics crossover and key curves, and the three identical panels at the bottom handle band-specific dynamics, each expanding to its full control set (over the top of the other two) when double-clicked. The buttons just to the right of the EQ display determine which EQ curves are shown, and which can be edited. For example, you can set the EQ to show both Pre and Post EQ curves (colour coded), but you also need to separately activate one or the other of them for editing in the display. Further buttons in this section activate shelving options for each band, individual band bypass, independent bypass for Pre and Post EQs, DC Filter and overall EQ Reset. Just below this, you'll find the Dynamics parameter buttons, with global (ie, applied to all bands) parameter Link, bypass (Active) and Reset. To reveal the full view for numerical parameter entry and bandwidth settings, double-click the EQ or Crossover/Key display. Master Mix is ideal for sub mixes (that is, group channels and busses) as well as mastering. The Dynamics section works really well, and we particularly like having band-by-band control of the key signal level and shape. The dynamics curves can also be tailored with up to four additional nodes, allowing you to create non-linear ratio response curves. The Master Mix EQ is a very straightforward design, and the separate Pre and Post sections make it easy to drive the dynamics with targeted frequency lifts, then add final sweetening with the post EQ stage. The only slight frustration is the lack of dedicated high- and low-pass filters. Master Mix includes around 40 presets, with the same names as many from the previous version. How close they are in sound, we can't say, but the fact that they've at least attempted to recreate them indicates considerable reverence for the original. For the most part, they're surprisingly good if a little dated ('CD Mastering', anyone? ), forming a solid library of starting points. Overall, Master Mix is a fairly old-school workhorse plugin that doesn't immediately appear particularly impressive by today's standards. Nevertheless, it has hidden depths, and what it does it does very well. Plus, it's simple to use, sounds good and represents great value.